Samsung Galaxy S III has aced in many smartphone battles with it's amazing Hardware and Software combination. The Quad-Core giant was announced back in May 2012 and grabbed lot's of attention from smartphone geeks. Now that many other brands introduced their smartphones in market, The S3 is getting old day by day. 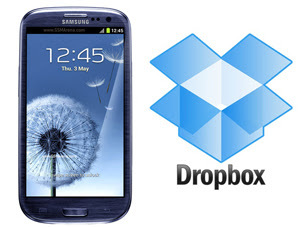 To keep their sales chart high, Samsung is offering 50GB Free Dropbox space for 24 months on purchase of Samsung Galaxy S III. Many people face problems getting the extra 50GB Dropbox storage after buying S3, So I decided to make a post on How to get 50GB Dropbox storage after purchasing S3. If you're one of the S3 user and were unable to get your 50GB storage then simply read the article. So before beginning let me tell you that you'll only get 50GB storage if you've bought the device after Samsung announced the offer. Assuming that you've already bought S3 You'll find Dropbox already installed, If it's not then download and install if from Google Play. If you arean existing Dropbox user then log in to your account, If you're new then create an account. After logging in account, Most people will find that they have only 2GB storage. 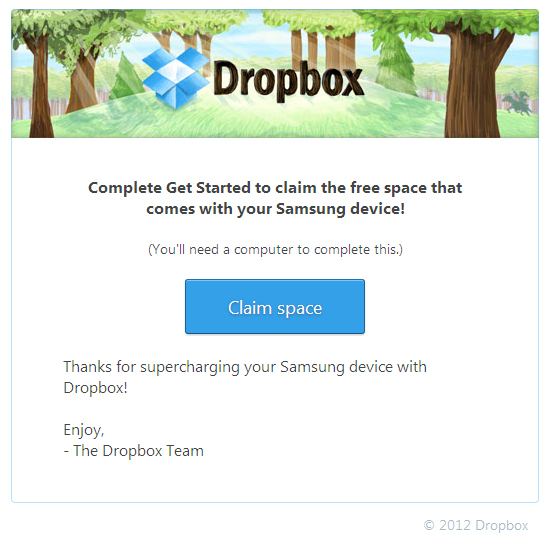 Don't Worry, just go your inbox and you'll find an email from Dropbox team with subject 'Claim your 48 GB of free Dropbox space!'. Just go throught it, Click the like and Bingo! You've successfully claimed your Free storage and Now you have 50GB storage in your Dropbox. The 48GB Free Dropbox storage will expire after 24 months (2 years) of claiming.